"Though it is pleasing to see so many people wanting to help others to bake real bread, I'm concerned that "time served" is apparently anathema to some of today's so-called artisans, whatever trade they practice. It seems that some people may have lost sight of the difference between the apprentice and the artisan, and that some novice bakers now even put themselves forward as teachers, writers or consultants quicker than no-time dough becomes a factory loaf. If real bread cannot be rushed, can real bakers and real bread teachers be created overnight?" There are interesting points in this quotation, some of which need to be explored and debated in order to nurture the tiny and growing commitment to real bread in the UK. Anything else would allow people to continue to feel intimidated by the superior positions taken by some well-known and/or large bakers, some of whom simply do not make great bread. The primary aim for anyone who is interested in real bread in the UK is to make real bread accessible to all and to make a dent in the dominant position held by industrially baked bread. The secondary aim is to engage people in the experience of making and consuming real bread - informing them about its systemic benefits and building a community around it. The aim cannot be to disparage those who are working to build their lives and communities by making real bread available where it is currently not - and that is almost everywhere in the UK. There are plenty of people who are classically trained, over many years (who have, therefore, served their apprenticeships) who cannot make a decent loaf of bread, mend a shoe or fix a tap. On the other hand, there are plenty of other people who are not classically trained who can make an excellent loaf, mend a shoe or fix a tap. Completing an apprenticeship is no guarantee of talent nor, even more importantly, does it indicate passion, dedication, commitment or love, all of which are critical components in the creation of a truly great product, and none of which are necessarily outcomes of apprenticeships. Now that there seems to be a strict definition of “real bread” with which nobody really disagrees, perhaps we need a strict definition of “artisan bread” or “artisanal baker”. An artisan is, according to audioenglish.net is “A skilled worker who practices some trade or handcraft”. This indicates clearly that some aspect of hand craft is required to make an artisanal product. The same source defines “skilled worker” as “a worker who has acquired special skills”. To that end, technically speaking, anyone who has acquired special skills and is using those skills to produce a product at least partially by hand, is an artisan. Nowhere in the definition does it indicate that an apprenticeship is required to be an artisan nor, clearly does it indicate that the end product produced by the skilled worker will be any good. Artisanal is a term that is used loosely and sometimes, possibly fraudulently. As ever, however, it is the buyer who must beware of the product he or she is buying. The label “artisanal” is not a guarantee of quality and may indeed be attached to a product that actually mass-produced. In the end, a too broad application of the term “artisanal” will indeed sully the market for truly artisinal goods. However, the truly great artisan will always have a large and loyal market whether or not he or she uses that term, assuming he or she creates a purchase and usage experience that is compelling and not easily copied. Products are purchased for many reasons and it is the complete experience of the customer that matters. This experience must deliver a compelling package of benefits including emotional and self expressive ones as well as functional ones. If the package of benefits that are expected by the consumer is met, the product has a market in the short, medium, or long-term. There is no other way to explain the longevity of the industrial bread market in which convenience, price and “stay fresh longer” are at least as important to the consumer as taste, nutritional content, and digestibility. Thus, it is clear that how and where the product is purchased, its price, brand values and how it make the consumer feel are, arguably, even more important to the consumer than the actual functional benefits. What is a real baker? What is a real bread teacher? Does a real baker bake real bread? If so, there is not an industrial baker alive who is a real baker, although he or she may have served an apprenticeship. Does a real bread teacher only teach people how to bake real bread? If so, few of the highly qualified trainers who are teaching in colleges up and down the land, preparing people for valuable jobs in the more industrial end of the catering industry is a real teacher. “Can real bakers and real bread teachers be created overnight?" The answer is a definitive yes. Maybe not overnight, of course, but certainly anyone with natural talent for baking can learn to bake excellent bread which they may choose to sell. If the experience of purchasing and consuming the bread is compelling enough, customers will repeat and recommend it, and a sustainable business will have been created. In this way, the baker will have acquired a set of valuable skills that he or she may wish to pass on. Once again, if that person has a natural talent for teaching and can create a learning environment that is compelling, people will consume, repeat and recommend the experience and once again, a sustainable business will have been created. Surely "real", in this context, means successful, talented, committed, and passionate. Not simply “time in position”. For generations, people learned how to bake at home. From an early age, they baked what we now like to call real bread, turning out loaf after loaf for most of their lives to feed their families, and they taught their children along the way. In most of the developing world people still bake this way. Sometimes they knead the dough at home and take it to the communal baker to bake. Other times they knead and bake at home. There is no doubt in my mind that these people were and are real bakers and real bread teachers in spite of the fact that they had no formal apprenticeship. The benefits of bread baked in this way, and by these people, go beyond bread as food. The benefits include the whole experience of baking and consuming the bread, and are successfully delivered by the skills, dedication, commitment, passion, and love exhibited by the bakers, however they learned. Thanks for joining in the conversation on this! Thanks for a thoughtful piece. I think your comments about what qualifies someone to teach - whether baking, cookery more broadly, or something altogether different - are spot on. It is not necessarily a case of how long you've been practising the skill you teach; providing you have a good level of competency (and don't over-reach that in what you attempt to teach) then it's all about passion, teaching skill and communication. Case in point: I had a rowing coach in my youth who knew *very* little about rowing. Not a good start... However, he was one of life's great enthusiasts - and what he did know he was fantastic at communicating clearly and effectively. We won a bunch of silverware. My question is:! Back in Germany I know that the baker makes 3 cross-cuts on a rye bread loaf before he bakes the bread. What is the reason to makes those maybe 1/4" deep cuts ? I buy my bread in a grocery store chain were the Doug is delivered.i guess frozen. Than they bake every day some of those loafed but before they bake it they make a Long cut down the lengs of the loaf. Because of that cut each slice has than a tendency to break the slice have open when you like to put butter or whatever on the bread. By cross cutting I think that problem could be avoided. Please help me with you expert opinion if my thinking is justified. 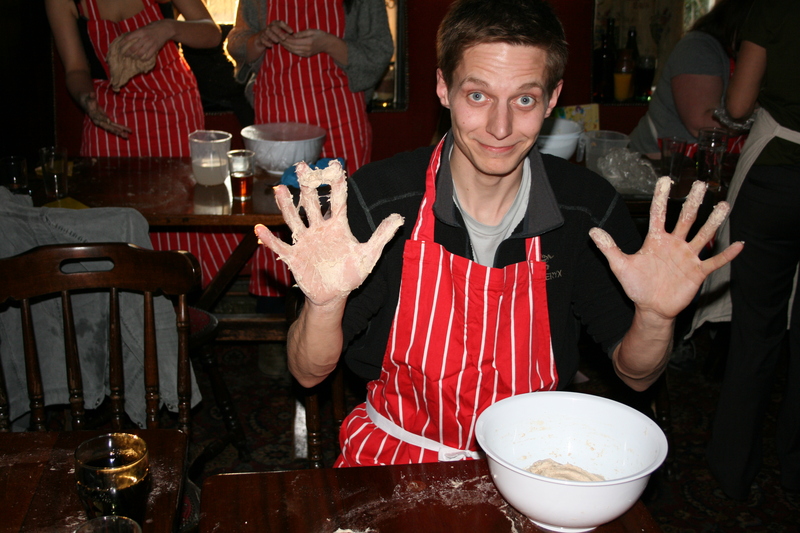 traditionally (really traditionally) cuts were made on dough to identify who the dough belonged to when you took your dough to the communal baker to be baked. Now they are used for decoration and to help control cracking in the oven. A baker cuts the dough as pleases him or her! You could get in touch with the manufacturer of the dough that is baked from frozen near you to discuss the problem?